Detect even the most minute amounts of radiation within seconds and immediately determine whether it is natural or artificial. 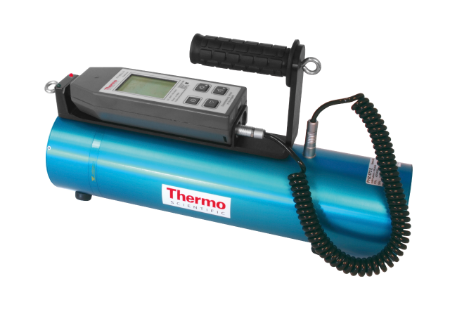 The Thermo Scientific™ FH 40 G NBR Survey Meter uses patented advanced Natural Background Rejection (NBR) technology to distinguish between naturally occurring radioactive material (NORM) and radiation from manmade sources. From first responders dealing with radiation emergencies to environmental monitoring and remediation personnel, this high-efficiency detector quiclky locates contamination or hidden radiation sources and accurately determines the dose rate. The FH 40 G NBR Survey Meter combines a Thermo Scientific™ FHZ 672 E series detector, composed of a highly sensitive scintillator detector and extremely fast evaluation electronics, with the Thermo Scientific™ FH 40 G Multi Purpose Survey Meter. The NBR technique of the FHZ 672 E probes differentiates between naturally occurring radioactive material (NORM) and artificial, man-made sources with simple to identify optical annunciation via red or green LED. This combination can be ordered to measure dose rate in R/h (verion FHZ 672 E) or to achieve an energy characteristic according to the ambient dose equivalent H*(10) in Sv/h with the version FHZ 672 E-10. The high efficiency of this detector allows an accurate determination of the dose rate within seconds for both versions. Powerful detection of DU-materials (depleted uranium) in the field. Tested and approved by TUV. 1000 times more sensitive than normal gas filled detectors. Measuring range of the sole FHZ 672 E probes is extended by simultaneously measuring with FH 40 G (up to 100 R/h / 1Sv/h). Artificial contribution of 1µR/h / 10 nSv/h can be detected within a few seconds even in fluctuating background radiation fields up to 10 µR/h / 100 nSv/h. Contaminated material or hidden sources are located fast and reliably. The stored measured values can be accessed any time and seen on the display of the advanced survey meter. For further processing and archiving purposes, it is possible to transfer the history contents to a PC via the FH 40 GL-10 interface. Guarantees that even the smallest changes of dose rate are immediately detected, while at the same time, statistical fluctuations are effectively suppressed. The desired functions can be activated or hidden to the user by using the Windows™-based configuration software. This means that the characteristics of the FH 40 GL-10 precisely correspond to the measurement task, thus operator errors are minimized. It can be made as simple or complex as required for user application. An operational FH40G NBR survey meter system consits of one FH40G series survey meter, one FH40G type connection cable and one FHZ 672 E series probe. Operation time with connected FH40G device: approx 30 hrs.